Three different camshaft combinations net power increases up to 61 HP COMP Cams New XFI. (Xtreme Fuel Injection) camshafts for Hemi-powered Chrysler vehicles dramatically increase engine horsepower and torque, yet retain compatibility with all OEM vehicle computer systems. Available in three different profiles (XFI 260, 268 and 273); the new camshafts are application-specific with designs for street performance and towing. In recent dyno tests on a Hemi engine using COMP's #26918 beehive valve springs and upgraded exhaust, the XFI 260 netted 20 additional ft pounds of torque in lower rpm ranges with a peak of 31 additional hp. The XE 268 camshaft added 14 ft lbs of torque at low rpm and 47 additional peak horsepower. The amazing COMP Cams XFI 273 camshaft yielded it's most significant horsepower increases over 4500 rpm generating 61 more horsepower than the stock Hemi 5.7-liter engine. "We're extremely pleased with the power gains we have achieved with these camshafts," said Scooter Brothers, VP of Engineering. "When we set out to offer specialized Hemi camshafts, we had an acceptable power increase figure in mind. 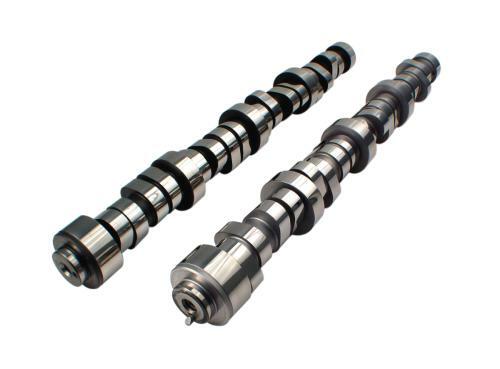 We have far exceeded that original target figure and believe that these three camshafts will offer customers the ability to find the exact camshaft that is right for their vehicle, car or truck."